A healthy diet is rich in foods with high nutritional value, providing your body with vitamins, minerals and other food nutrients it needs to protect against disease and maintain a healthy weight. Sweet potatoes are a great source of vitamin A. Packed with nutrients such as beta carotene, vitamin C, vitamin B3, vitamin B5 and vitamin B6, potassium, copper, manganese and fiber, they are low in calories making them a good addition to a healthy diet. One medium sweet potato means about five inches long and two inches in diameter has 1096 milligrams of vitamin A and 103 calories. You will also get 2.3 grams of protein, 542 milligrams of potassium (that meets 12 per cent of your potassium need for the day) and a negligible amount of fat in that serving. It is not only a better food choice but also helps you in losing a few pounds. Since vitamin A is a fat-soluble vitamin, adding some healthy fat such as olive oil to it can help you absorb more vitamin A. Eat baked sweet potato with a drizzle of olive oil, chopped walnuts and a sprinkle of cinnamon. Baking them is a better choice than boiling. Boiling can cause water-soluble nutrients to be lost. It is best to consume as a side dish or snack. Not only is it delicious and so healthy but it is super easy to make. Sweet potatoes give a break from the normal routine diets by providing an array of varieties, cooking techniques and recipes. Sweet potatoes are loaded with fiber. So they help you feel full for longer time. You tend to eat less and stay on track for shedding weight. When you visit a farmer’s market or organic section of a grocery store, you will encounter white, yellow, purple, brown and red-skinned sweet potatoes. Grab one each you can find. Each will have a distinct taste and texture. The various colours of sweet potatoes indicate the variety of antioxidants they contain. The orange ones get their colour from the beta-carotene and the purple kind have a different kind of antioxidants called anthocyanins. Their skins are also absolutely edible. It is good to know that the sweet potato’s nutrients are well preserved when prepared and eaten with skin. Just make sure that you have washed and scrubbed them thoroughly before using them in recipes. When possible, go organic. · Help reduce chronic inflammation in the body: Sweet potatoes contain powerful anti-inflammatory properties. With a high concentration of choline, they help reduce inflammatory responses in the body resulting in less inflammation. 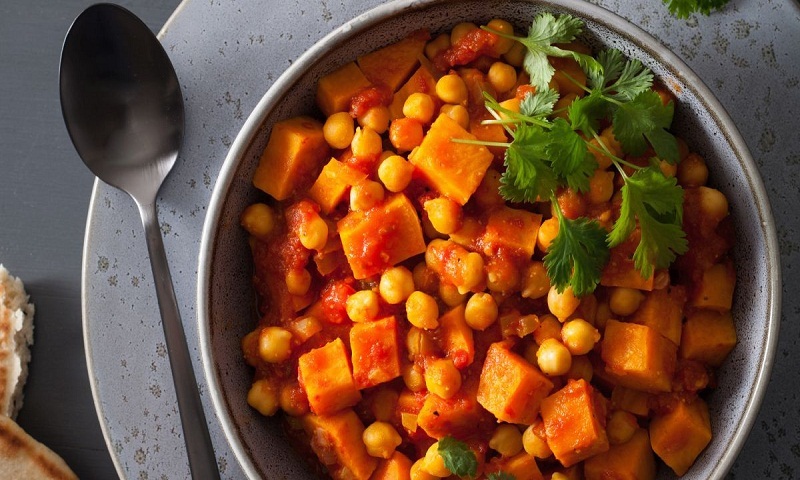 · Help protects, prevent or manage cancer: The variety of sweet potatoes contains elements that may help inhibit the growth of specific cancers including breast cancer, gastric cancer and colon cancer. They can also induce cell death in prostate cancer cells ensuring that cancer does not grow and spread to other parts of the prostate. · Good for eyes and vision: Being rich in vitamin A, beta-carotene, sweet potato is high on the eye-health-food list. A one cup serving of sweet potato has more than the full daily requirement of vitamin A. · Help regulating blood pressure: This sweet root is high in potassium. Potassium is an important electrolyte that helps regulate blood pressure by counteracting the effects of sodium in the body. It also helps eliminate sodium through urine. · Minimise the risk of cardiovascular diseases: The high fiber content can lower LDL (bad) cholesterol, helping to prevent cardiovascular diseases. Being high in potassium, they work in balance with sodium in the body to maintain healthy blood pressure which also aids good heart health. · Help manage stress levels: Being a rich source of vitamin D, this root vegetable helps in maintaining an immune system which helps you with mood swings, ups your energy levels and much more. · A potent weight-management diet: Sweet potatoes are low in calories and high in fiber. Thus they make you feel full and prevent you from overeating. They also encapsulate fat molecules, prevent fat absorption and promote stool movement in the colon. They improve metabolism, digestion and excretion – all leading to weight-loss. · Help improves skin and hair: Consuming vitamin A driven foods is ideal for supple and glowing skin. It is also beneficial for strong, healthy and lustrous hair. · Good for digestion: Sweet potato is high in fiber. Thus it promotes the healthy digestive system and prevents constipation. · Helps in treating wounds inside the body: Extracts from sweet potato contain free radical scavengers which help in healing wounds inside the body. Also, the menthol extract from the root vegetable can help guard against ulcers in gastrointestinal tissue and can be used in treating peptic ulcers. · Boost fertility: Sweet potatoes are a great source of healthy carbs and they are also high in vitamin B, vitamin C and vitamin B6. These antioxidants protect against cell damage. So they are great for protecting your egg and improve egg health. · Help manage diabetes: Even though sweet potatoes have a fairly high carbohydrate content, their glycemic index is considered to be moderate that does not cause an instant spark in blood sugar levels. · Enhance memory: The anti-inflammatory properties of sweet potatoes help improve memory and brain functions. They are also recommended as a preventive measure for memory problems from Alzheimer’s disease. Winter is the right season to stock up on this sweet root vegetable. It is often associated with winter healthy treats. If you have not tried them yet, consider adding them to your daily diet to bring a pop of colour to any meal.